Starting from an undergraduate level, this book systematically develops the basics of * Calculus on manifolds, vector bundles, vector fields and differential forms, * Lie groups and Lie group actions, * Linear symplectic algebra and symplectic geometry, * Hamiltonian systems, symmetries and reduction, integrable systems and Hamilton-Jacobi theory. The topics listed under the first item are relevant for virtually all areas of mathematical physics. The second and third items constitute the link between abstract calculus and the theory of Hamiltonian systems. The last item provides an introduction to various aspects of this theory, including Morse families, the Maslov class and caustics. 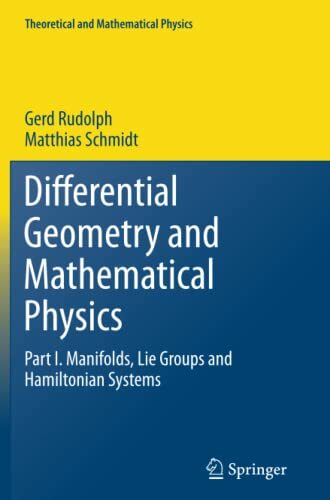 The book guides the reader from elementary differential geometry to advanced topics in the theory of Hamiltonian systems with the aim of making current research literature accessible. The style is that of a mathematical textbook,with full proofs given in the text or as exercises. The material is illustrated by numerous detailed examples, some of which are taken up several times for demonstrating how the methods evolve and interact. This book methodically covers Analysis on manifolds, Lie groups and G-manifolds; Symplectic algebra and geometry, Hamiltonian systems, symmetries and reduction; Integrable systems and Hamilton-Jacobi theory, including Morse families, the Maslov class and more.